Breakfast is an important meal. If you've been skipping it because you don't have time, try this recipe. It takes about five minutes to make and it will provide the energy you need to start the day. This big breakfast cost about $1.50 to make and is great for lunch or a quick dinner too. Heat oil in a large heavy skillet over medium-high heat. Add the spinach to the skillet and cook, stirring often, for two minutes. Add eggs to the pan and cook, stirring frequently for about one minute or until just starting to set. Add the cottage cheese, salt and pepper and cook for another 1-2 minutes until eggs are done. 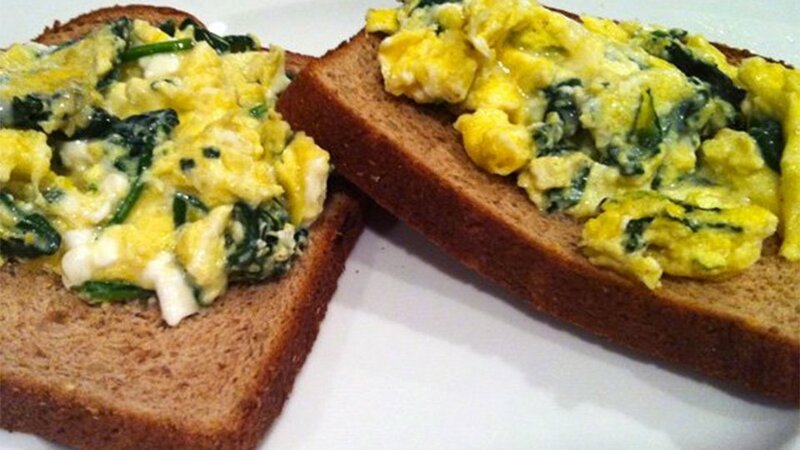 To serve, place toast on a plate and divide egg mixture between the two slices. Makes one serving.